U.S. EPA Administrator Scott Pruitt, who spent much of his pre-EPA career suing the agency he now leads, has made no secret of his skepticism about the well-established role human activities play in recent global warming. His latest move would challenge scientific consensus on climate change through a “red team-blue team” exercise designed for crafting defense and intelligence strategies. The process of opposing red and blue teams — the consensus on one side with an equal number of opponents on the other — that Pruitt endorsed again last week might work well to encourage new ideas and test the strength of existing ideas. Indeed, it has been used by major companies in internal strategic exercises, but it is entirely inappropriate for science. It has no place in determining the science of a changing climate. Scientific understanding, unlike proposals for what to do about a given problem, is well established through the scientific method. That’s right: even Pruitt acknowledged the importance of peer-reviewed science. To be accepted into a scholarly peer-reviewed journal, scientific papers, which form the basis of the scientific consensus, are independently reviewed and commented on by a range of experts in the same field. This is an essential part of ensuring the quality of published research. It subjects research findings and methods to others in the field for question, and papers are either rejected, edited or accepted. Many journals also allow other scientists to publish critical comments on published studies, and some journals also have an open peer review process where the public may be able to view review comments and authors’ replies or even comment themselves. If skeptics want their voices heard in scientific discourse, they should try to get their findings published in the peer-reviewed literature. They would then be assessed on their merits through peer review. Indeed a small handful of papers have made it through the peer-review process to be published in the scholarly literature. The overwhelming majority — 97 percent — of peer-reviewed papers in the literature support the consensus view that human activities have contributed to the majority of recent warming. 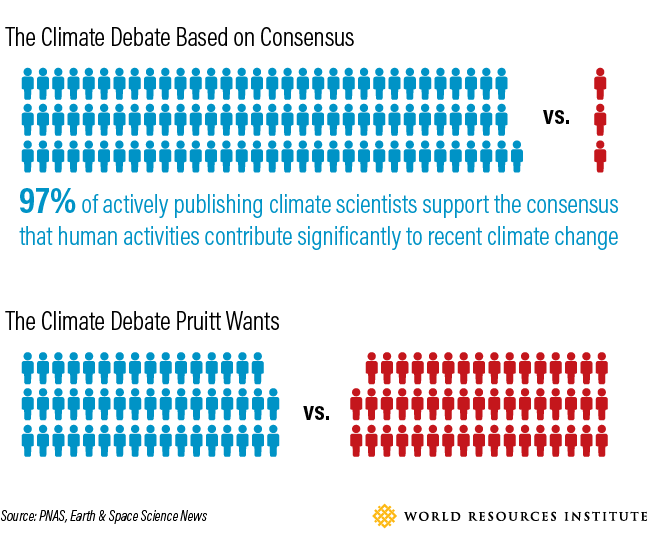 Because a “vanishingly small proportion” of published research rejects the scientific consensus, giving equal, 50-50 weight to both the red and blue teams in the exercise would mislead the public into thinking there is a debate when there isn’t one. And the Trump administration is likely to stack the red team with fossil fuel industry interests, as it has done with its cabinet positions. A review of climate science from the ground up is like re-inventing the wheel. There is little point to debate over something that has been confirmed and repeatedly reconfirmed. If the Trump administration wants to advance scientific understanding, how about boosting — or at the very least, not slashing — the budget for climate science research? Across the board the administration is rolling back progress and has proposed significant budget cuts to climate science and technology research, such as to climate research at EPA and its Office of Research and Development; NOAA’s satellite division; the Advanced Research Projects Agency (ARPA-E), which funds research in energy technology development; and NASA Earth science missions, among others. The time for debate on the reality of human-caused climate change is at an end. The Trump administration needs to realize this unless it wants to keep the United States mired in the past, unprepared for a lower-carbon future.